YOU DON’T HAVE BE NAMED MANDELA, OR KING, OR GANDHI TO WIELD THE POWER THAT HAS LAUNCHED SOCIETY FORWARD. WE’VE COLLECTED 110 METHODS THAT MANY HAVE USED TO BEND THE LONG ARC OF HISTORY TOWARDS JUSTICE AND PROSPERITY FOR ALL, AND DELIVERED THEM TO YOU THROUGH A UNIQUE DESIGN KIT. 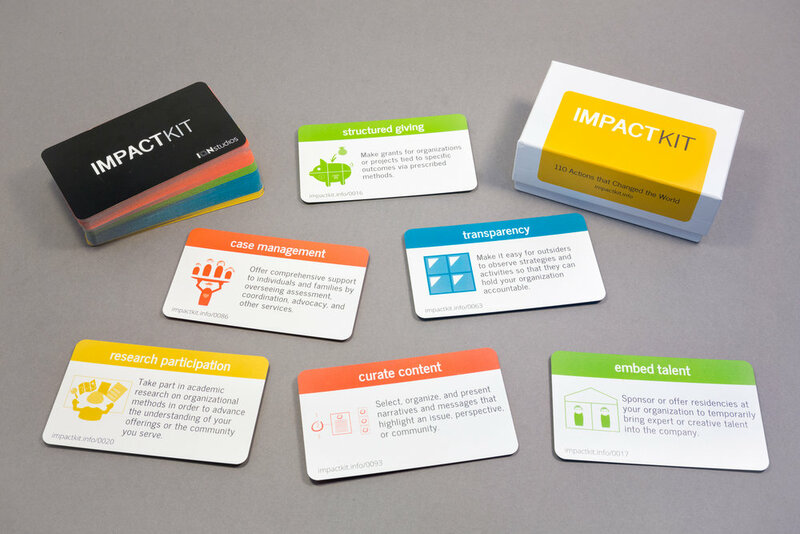 ImpactKit is a workshop-in-a-box for teams looking to create outsized social impact. presenting methods that have changed the course of human history, used on the frontlines of social change and the halls of power around the world. Our research team collected over 2500 techniques, practices, and tactics that have been used to change society in big and small ways, then spent months sorting and combining them into 110 methods that were as universal and useful as possible. ImpactKit is your roadmap to exploring new options for changing the status quo, unifying your teams’ thinking, or designing targeted actions to take on the most urgent problems the world faces. Our online portal extends the information on each card giving you access to examples, in depth descriptions, potential pitfalls, and common resources used to activate each method. The online portal also includes key information about how the methods were curated and how to use them for full effect. To make sure you get the most out of the cards, the online portal also contains 10 design, communication, and strategy activities to help you get started using the cards. Use them to lead your own design and strategy sessions, tell the biggest story of your work, and help others to explore new possibilities. Join a community of users that span six continents, from hundreds of organizations, and tackling a broad range of global challenges.